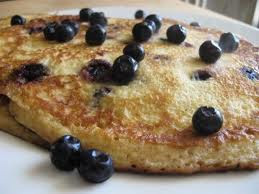 I think that I have perfected a couple of recipes for making Blueberry pancakes. The first, most important thing to remember is that the berries should be as fresh as possible. They are available everywhere, here in the Finger Lakes Region of upstate New York from mid to late June through the end of August. If you are able to buy them from one of our many local farm markets you will be getting the freshest, most plump and sweet ones. Most groceries will offer them year round for a price off-season, and since they may have to be shipped, their freshness may be questionable. If you use frozen Blueberries, that is certainly fine but be sure that they are firm and not mushy. Shake the bag to be sure they are separated and not clumped together. This may mean that they were allowed to thaw at some point and then were refrozen. If these berries are used there will be a soggy non-cooked look and taste inside of your pancake or waffle. The same is true when baking muffins. Unlike my crepe recipes, (recipe below) I most often use packaged pancake mixes that you can easily find in the store. I do, however find them boring all on their own and usually just use the mix as a base, then I like to enhance their flavor and richness by adding a few other ingredients. I recently came across a whole oat grain pancake mix on the shelf produced by Quaker Oats. I love the crisp, light texture this mix gives to pancakes or waffles. I combine a one to one proportion of oat grain mix together with (any) brand name, regular pancake mix, almost always with buttermilk, such as Aunt Jemima's or the like. It seems to be that if I use all whole grain flour, the texture seems to be too grainy. Using all non-whole grain leaves a floury, starchy consistency, and cake-like taste. So, a mixture of the two works great to create the desired amount of crispness on the outside. I like to add an egg or two, even if the mix already has egg contained in it. And, to add moisture, about two tablespoons of melted butter or corn oil at the end just before hitting the ready-hot pan. This all depends on to whom I am serving my delicious Blueberry delights. Adding butter, oil, or eggs also increases the amount of fat and cholesterol. I try to have a variety of alternate "lite" recipes on hand so that I can serve to those wanting less calories and a healthier choice. These two links will give you gluten-free and low-fat ideas. These crepes look fantastic and can be enjoyed by drizzling any berry, maple syrup, or honey on top or inside! I absolutely adore crepes of all kinds! There is nothing more delicious than a heated Blueberry sauce poured over hot cheese filled thin roll ups. Also, you may have tasted Crepes Suzette with Strawberries, the French variety usually contains a lovely splash of Kirsch liquor and are served flambe. I have tried the original Polish style crepes when I visited Poland, called Nalesniki. 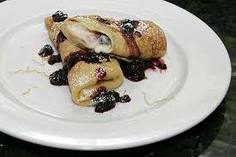 Just like all crepes, you can fill them with just about any berry and they also taste wonderful filled with any slightly sweetened soft ricotta, farmer's, or cottage cheese. (see the Nalesniki link). Okay so here is a good recipe for Blueberry crepes and I would love to give credit where it is do, but wouldn't you know that I saw this exact recipe online (verbatim) on about three TOP cooking websites, all claiming this to be their own! Yeow! Well, this is not my original but I tried it and the results are delicious because of the use of the lemon zest! No wonder everyone wants to claim it! This is an elegant dish for a special brunch or breakfast. Top these crepes with blueberries or blueberry sauce, along with a little whipped cream and strands of lemon zest. and refrigerate let stand for 1 hour or refrigerate for up to 12 hours. coats the bottom of the pan. Cook until the edges begin to brown. Carefully lift with a thin spatula and flip over. Cook for a few seconds, just until lightly browned. Place on a plate and repeat with remaining batter. separate the crepes with small squares of waxed paper. Heat oven to 350°. Butter a 9x13-inch baking dish or spray with cooking spray. brush with butter, sprinkle with cinnamon sugar, and bake for 20 minutes. Ohhh my! Sooo Delicious! And don't plan on keeping any diet. Just splurge and enjoy...if you can! I will be adding one other post about baking pies and muffins with Blueberries. This post was long enough containing information about pancakes and crepes.